Professor Ved Prakash, Honorable Chancellor, KIIT University in presence of Prof. Ganeshi Lal, Hon'ble Governor of Odisha hands over the certificate of Honorary Doctorate to Dr. Md. Sabur Khan, Founder and Chairman, Daffodil International University (DIU) at 14th convocation of KIIT University. In recognition of his vision to digital transformation of society, skill management to imbibe the spirit of entrepreneurship in every youth, and social contribution to destitute children through Daffodil Institute of Social Sciences (DISS) in association with Kalinga Institute of Social Sciences(KISS), Bhubaneswar, India, the Management of KIIT University unanimously resolved to confer the Degree of Doctor of Letters (HonorisCausa) upon Dr. Md. Sabur Khan, Founder and Chairman, Daffodil International University (DIU), Bangladesh on 10th November, 2018 on 14th Annual Convocation of KIIT University. 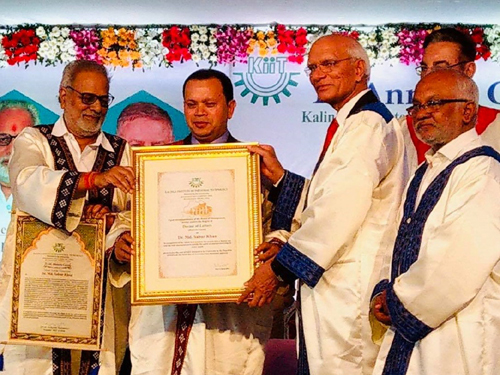 The degree was awarded by Professor Ved Prakash, Honorable Chancellor, KIIT University in presence of Prof. Ganeshi Lal, Hon'ble Governor of Odisha and the Top Management of KIIT University. The degree certificate was signed by the Prof. Hrushikesha Mohanty, Vice-Chancellor and Prof. Sasmita Samanta, Registrar of the University; a citation signed by Dr. Achyuta Samanta, the Founder, KIIT was recited on the occasion dedicating Dr. Khan. Dr. Khan was given the cordial reception as per the KIIT tradition. Dr. Khan accepted public felicitation from and on behalf of the People of the State followed by his reciprocal speech. This ceremony was graced by Hon'ble Governor of Odisha as the Chief Guest and Hon'ble Minister, Hon'ble Member of Parliament (Bhubaneswar) and Hon'ble Mayor, Bhubaneswar as the Guests of Honor. Over 600 elite group people from all walks of lives joined the programme. Motivational speech by Dr. Khan in front of more than 54000 students in total took place, where KISS University Campus Felicitation in front of 27000 KIIT students, followed by his motivational speech to the 27,000 indigenous children of KISS wereheld. With a view to making a self-employed and self-dependable generation, Mr. Khan aims to create more job opportunities; his innovative initiatives like: business incubator, startup, venture capital, Department of Entrepreneurship at the university level, are notable to promote entrepreneurship. He has been a visiting professor at some foreign universities, including Malaysia, Indonesia, India, and Kirgizstan. He has been awarded with some fellowship and honorary doctorate. As the resource person, he has delivered many public lectures, corporate and motivational talks, interviews and talk shows in media since the beginning of his significant career of more than 28 years. He has published some books on entrepreneurship in two languages and is conducting classes in different universities on entrepreneurship development. He has been involved with social welfare through Daffodil Foundation and DISS.